Our work at the Institute for Global Prosperity (IGP) is global. We currently work in three main areas: East London, Lebanon and Kenya - our sites of exemplification. The research that takes place in these sites provides excellent opportunities for comparative, transdisciplinary resesrch aligned to local needs and stakeholders. Throughout 2017-18 we have been working to establish partnerships and programmes of empirical work that will become the basis of a series of Collaborative Prosperity Laboratories (PROCOL). The aim of these laboratories is to bring together policy-makers, businesses and entrepreneurs, and community organisations alongside natural and social scientists to explore the nature of sustainable prosperity under specific local conditions and to co-design appropriate solutions, institutions and policies for the future. 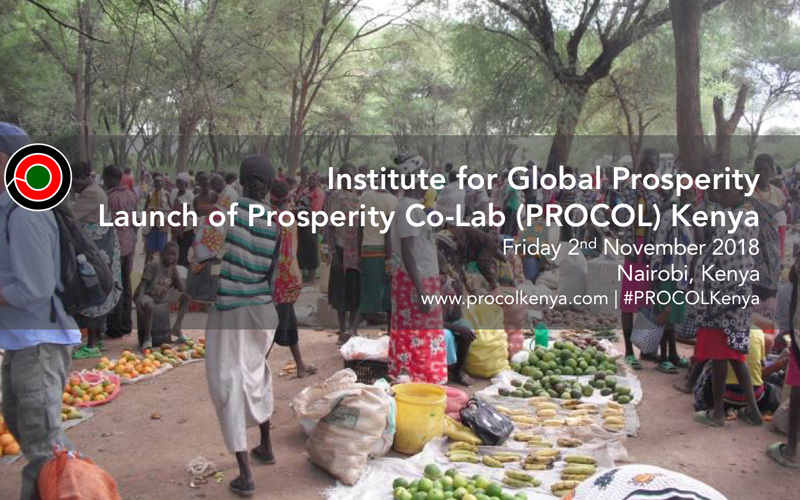 Today we are delighted to launch our first Prosperity Co-Lab (PROCOL) in Kenya. PROCOL Kenya is an innovative collaborative research programme seeking to broaden the discussion of what constitutes prosperity in Africa, focusing particularly on sustainable cities, quality of life and understandings and measurements of prosperity. It constitutes the flagship programme for IGP's research in Kenya and is part of the consolidation and expansion of our existing research in the region. At today's event, we launch PROCOL Kenya as a partnership with invited stakeholders from Kenyan national and county governments, international organisations, Kenyan Universities and local community groups. In close collaboration with these local partners, our research will set out to harness cutting-edge science, community knowledge, astute policy development and participatory research methods to develop smarter, localised understandings of prosperity that can be tailored to communities across Africa. PROCOL Kenya will begin by mapping out a new paradigm for sustainable ecological management and future rural livelihoods, based on a re-valuing of nature and the concept of Natural Prosperity. Drawing on IGP's Prosperity Collaborations and Prosperity Metrics work from elsewhere in the world, we will re-map metrics of wellbeing and quality of life on to measures of environmental quality, linking these explicitly to the Sustainable Development Goals (SDGs) and the four pillars of Kenya's Vision 2030. Our aim is to re-think the delivery of SDGs and Vision 2030 in light of climatic and demographic change and in ways which are resilient, sustainable and both socially and environmentally just. For more information about PROOCL Kenya visit our new website www.procolkenya.com. PROCOL Kenya is led by Professor Henrietta Moore, Professor Jacqueline McGlade, Dr Wilson Kipkore, and Dr Matthew Davies. Following the launch of PROCOL Kenya, we are organising the first PROCOL Kenya workshop at the British Institute of Eastern Africa, Nairobi, Kenya. This workshop will explore common misconceptions between scientific, institutional and public understandings of climate change and examine how more effective methods of communication and behaviour change may be developed. It focuses on sharing knowledge and approaches across the sciences, and on breaking down differences of understanding. The workshop will focus on three panel discussions with leading UCL, UK and East African figures. Panellists will present short “think pieces” designed to stimulate debate with the audience. For more information about the event, and to register for it, click here.